Why Enchanted? "Cause no one ever reach its bottom." 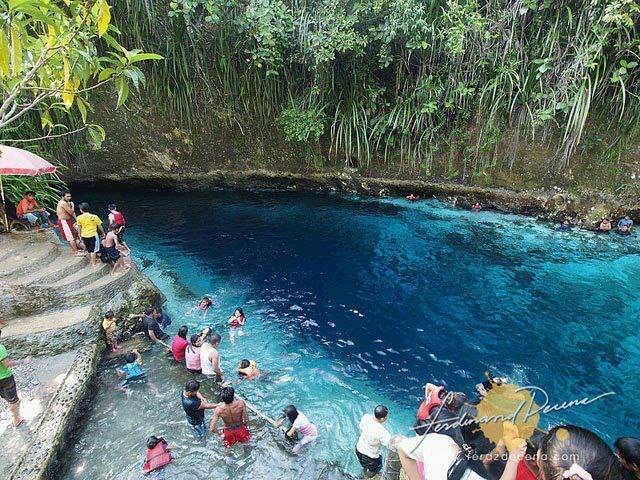 Enchanted River is found in Barangay Talisay, Hinatuan, Surigao del Sur. It is called "enchanted" because no one has ever reached its bottom. Many people, including scuba divers, have tried reaching for the bottom but have failed, hence the legend of its bottomless pit. Moreover, locals share that NOBODY has been successful in catching the fish in this river, whether by hand or by spear. They say its bluish color is a result of its depth and the water clarity changes throughout the day. At around 12:00 nn, the water becomes clearer and even more majestic. Once the bell is rung at noon, the people swimming get out of the water and the fish start appearing to enjoy a feast. Fish feeding is done daily and serves as entertainment most especially for the locals during weekends.